Web Works 5 Year Anniversary! 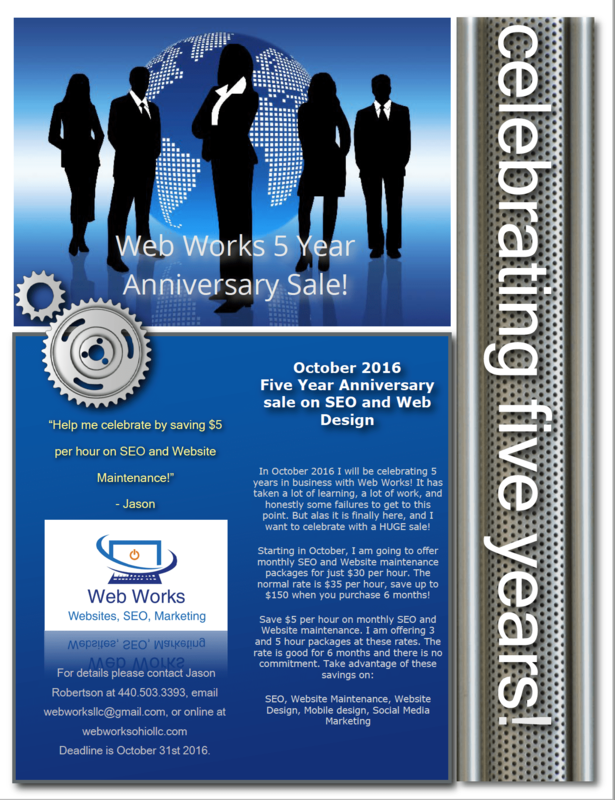 I am extremely proud to announce the 5 year anniversary of Web Works in October 2016. When I started the company, I had no idea that I would get to this point. Over the years I have developed some really nice customers, have gained a TON of experience, learned new techniques and technologies, and frankly failed a little bit too. Though each experience I learned something; whether it was how to treat a valued customer, or how to set up an e-commerce store, each experience has lead me to celebrating 5 years in business. I’m also proud to say that I will be moving to a new office this month! I will publish the address and office number as soon as my new office is ready.